I was going to let it pass. Barack Obama had won decisively, thanks in part to the support of an overwhelming majority of Jews, and I was ready to move on. But during services a few days after the election, my mind hesitated on the twelfth blessing of the Amidah prayer. May there be no hope for the slanderers among us, it begins. It goes on to invoke divine wrath against Jews who would slander their own people and likely dates to the time of the Maccabees. It reminded me how unseemly it was for an organization with the word "Jewish" in its title to unapologetically ignore the contempt our faith has traditionally held for rumor and character assassination. Specifically, it reminded me of the November 9 op-ed piece Brooks wrote for the Jewish Telegraphic Agency. It is a lame and lied-filled post-election attempt to justify the actions of his organization that demands a response. From the beginning, the Republican and Democratic candidates competed for support in the Jewish community. They elaborated on their solutions for critical issues like our troubled economy, the threat of a nuclear Iran, continued Hamas violence against Israel and the need for energy independence. The Republican Jewish Coalition helped not only raise these critical issues, but helped the Jewish community get clear answers. The RJC did nothing to “help raise these issues.” These top-of-mind issues have been intensely debated by Americans from virtually every background and political persuasion for years. 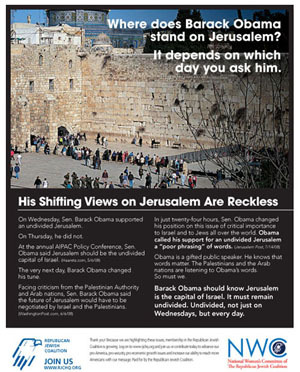 As far as clear answers are concerned, well, I read through the anti-Obama ads the RJC ran. I found lots of innuendo, half-truths and outright lies, but no answers, clear or otherwise. Indeed, the whole point of the RJC ad campaign was to inhibit clarity. Its purpose was, in classic Rovian fashion, to spread doubt by exploiting people’s prejudices and fears with lies. Since the first days of the election campaign, the RJC challenged President-elect Barack Obama to articulate his positions on these issues, and through our actions, let him know that the Jewish community would carefully examine his responses. As a result, neither party nor candidate took the support of the Jewish community for granted. The RJC is proud to have played a role in facilitating this important debate. Obama needed no one, least of the all the RJC, to challenge him to articulate these issues. They were already articulated on his web site and in numerous position papers published by his campaign, and he did not waver from them as the campaign progressed. As for the RJC being proud of ensuring that both candidates took the Jewish vote seriously, don’t make me laugh. Not taking the Jewish vote for granted is a lesson American politicians have been taking to heart for more than a generation. Despite this tsunami of Democratic resources, Obama was unable to exceed Bill Clinton or Al Gore, and only slightly improved on John Kerry’s support in the Jewish community. Unlike many other constituencies that had huge increases in support for Obama, Jewish support for him showed only slight gains and lagged far behind other key demographics. Let's begin our analysis of Brooks's statistical insights with the commonly accepted truth that one cannot get any cross section of Jews to agree unanimously on anything. (Remember the Golden Calf? The Israelites couldn't even agree on accepting the Torah!) Which means that 80 percent agreement among Jews is about as good as one can get. As the following chart shows, that's the percentage of Jews who voted for Bill Clinton, the highest percentage of Jewish votes for a presidential candidate in a generation. Obama is off Clinton's record by just two percent. Two percent! That's for a guy whose middle name is Hussein. A guy who had limited governmental experience relative to his opponent. A guy who had to fight against a carefully choreographed campaign of lies and smears, not to mention the residual racism that still plagues portions of the Jewish community. Given these realities, the near record-high support of American Jews for Obama is an extraordinary achievement. Brook's attempt to minimize it is one more example of his contempt for the truth. Throughout the fall, through our efforts, the RJC challenged the candidates to specify their policies. If Obama’s positions on Israel, Iran and the Middle East evolved throughout this election, it stands testament that he, and his campaign, understood the RJC’s message and adjusted theirs. The key word is the "If" that begins the second sentence. In reality, there was no "If". With the exception of some minor clarifications, Obama's positions on Israel, Iran and the Middle East did not essentially budge from where they stood at the start of his campaign. The only thing the Obama campaign needed to understand about the RJC's message was that it was crafted by liars. While we congratulate President-elect Obama on a hard-fought campaign, we are disturbed by some emerging trends that we hope do not continue. Throughout the campaign, Democrats consistently resorted to ugly intimidation to silence our message and stifle this important debate. It even went so far as the Obama campaign and other Democratic entities refusing to debate RJC surrogates. It is true that some surrogates and representatives of the Obama campaign refused to debate with the RJC. I wonder why. Hmmm. Wait! Could it be because lying is not an commonly accepted form of legitimate debate? You think? When the RJC brought up legitimate policy differences, some Democratic surrogates reflexively called our questions “smear and fear” tactics and refused to discuss the important issues. Some discourse was marred by episodes of vicious attacks against our organization—at times even becoming personal. One Democratic surrogate, and former Clinton administration official, likened the RJC to Yasser Arafat. Clearly this goes beyond any acceptable level of discourse. I don't know the former Clinton campaign official who Brooks is referring to and I have no memory of anyone likening the RJC to Arafat. But let's say for the sake of argument that what Brooks reports here is true. Given that the RJC ran an ad in 2005 that likened then DNC Chairman Howard Dean and the Democratic party to Palestinian suicide bombers, I'd say we're even. The kind of behavior Reid is exhibiting is an all-too-familiar hallmark of the Obama campaign and other Jewish Democratic entities. Particularly regarding the actions of Jewish Democrats who engaged in these blackball, retributive tactics, it is unfortunate that they do not revere, as we do, the Jewish intellectual tradition of debate. Our tradition teaches us that we hold the capacity to accept multiple opinions—even to value opposing positions. The Talmud says these opposing positions are to be valued as they may prove to be correct someday. We know now that Obama urged Reid and the Democrats to go easy on Leiberman and, to the dismay of some partisans, that they heeded his call. This despite Leiberman's whole-hearted support for not just McCain, but for Republican candidates across the country. And this despite his passive performance as chair of the Senate Committee on Homeland Security and Governmental Affairs. That is the Senate's version of Rep. Henry Waxman's Oversight Committee in the House. Unlike Waxman's enthusiastic probing, Lieberman conducted zero proactive investigations into Bush administration malfeasance, including its shameful response to Hurricane Katrina. Today, our nation moves forward into a new chapter. We come together in the Jewish community not as DemocratToday, our nation moves forward into a new chapter. We come together in the Jewish community not as Democrats and Republicans, but as Jewish Americans united in our resolve to move our country forward. We pray that President-elect Obama will stay true to his campaign commitments and promises to the Jewish community. Our Jewish tradition, however, teaches us not to shy away from debate not stand by idly. The RJC stands guard over our right to always raise the issues of critical concern to our community and sound the alarm when necessary. An alarm needs to be sounded, all right. Every time Brooks and the RJC opens their mouths. "Liar! Liar!" it should scream. And that's the truth. Charles Smolover is Vice President of the Philadelphia Jewish Voice.